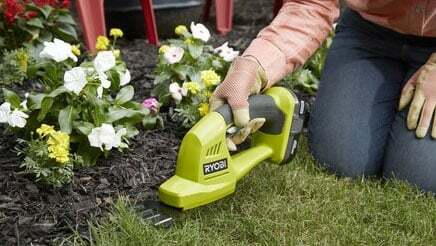 Ryobi is gaining popularity with consumers year after year. The brand offers a complete range of outdoor power tools, allowing consumers to use the same batteries for all their tools. Over the years, they have built a solid reputation for themselves. 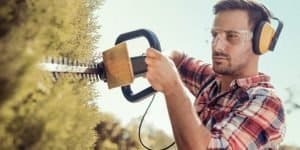 Ryobi hedge trimmers are sold at the biggest retailers in the country, adding to the attractiveness. 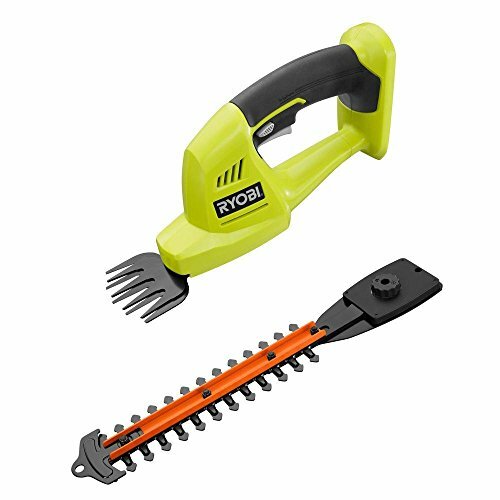 I have done some research about the Ryobi brand, and found some interesting facts. 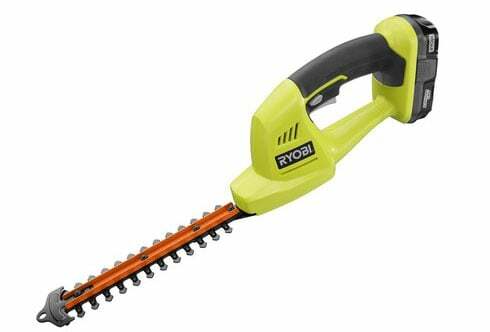 I have also reviewed all currently available Ryobi hedge trimmers. If you’ve any shopping at all, you may know that not all brands are available in all stores. Some brands may have agreements only with certain stores. Officially, Ryobi is sold exclusively at Home Depot. However all models are also available for purchase from Amazon. 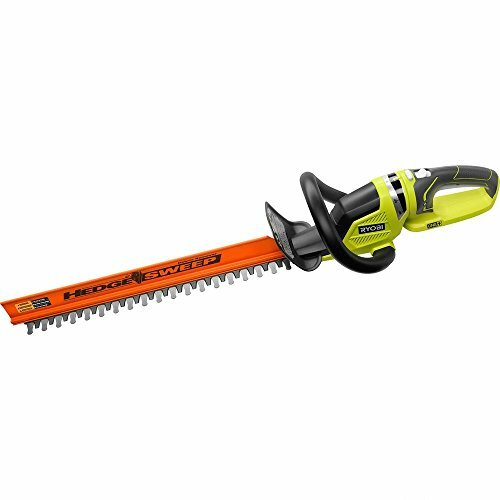 Since you most likely came to this page to read Ryobi hedge trimmer reviews, we will get into that bit first. After the review section you can find some general information about the brand itself. 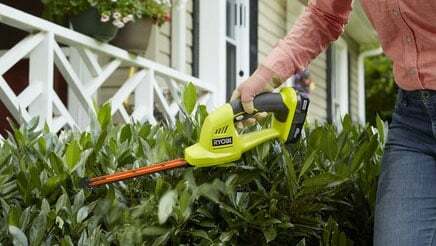 Currently Ryobi only offers three models of hedge trimmers in their range. They are all battery powered models. I am definitely an advocate of battery powered garden tools. No more noxious fumes and noisy gas engines. Also, no limitations, or danger of cutting through any power cords. The Ryobi hedge trimmer line up is straightforward. The flagship model is the 40 volt model. I have reviewed that one just below. Then comes the 18 volt model, which has proven to be a bestseller. Then there is the smaller trimmer, also called a “shrubber” by Ryobi. Presumably because it is meant to shear shrubs. 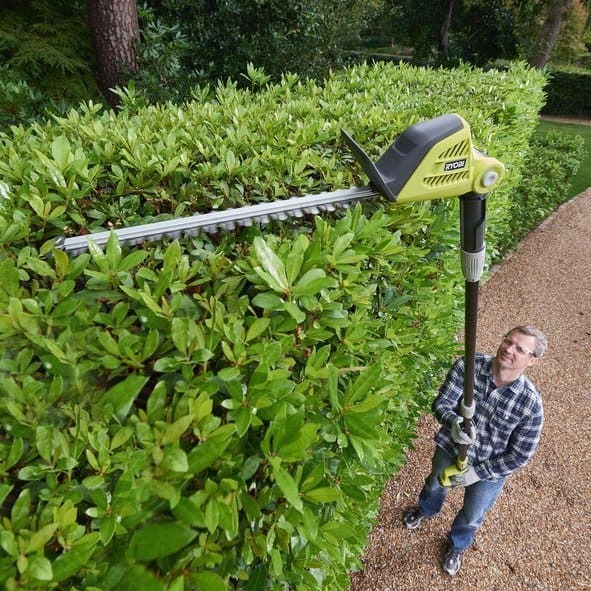 Ryobi offers a 5 year warranty on its hedge trimmers. This shows that the company really stands behind their products, and should make you feel comfortable making the purchase. 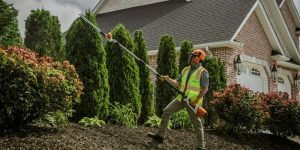 If you’re looking for a hedge trimmer, you will most likely be interested in any of the first two models. Which one will be best for you depends on a few factors, that I will get into in the reviews below. Keep reading. 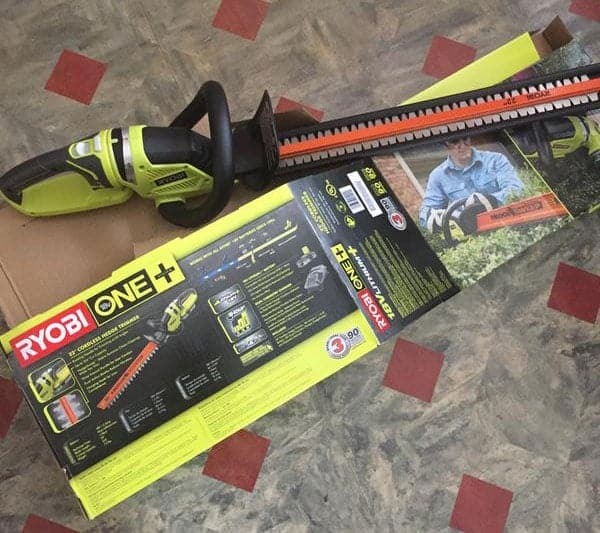 Ryobi sells their hedge trimmers without battery and charger. 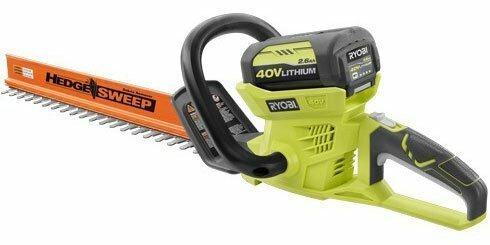 If this is the first Ryobi battery power tool you are purchasing, you will have to buy a battery and charger to go along with it. They do this so that once you own a battery and charger, you can then just buy bare tools, as you can use the same battery in every machine. If the batteries are of the same Voltage and of the One+ variety, they are interchangeable between tools. This is a fully cordless trimmer that has the power of a gas-powered device. 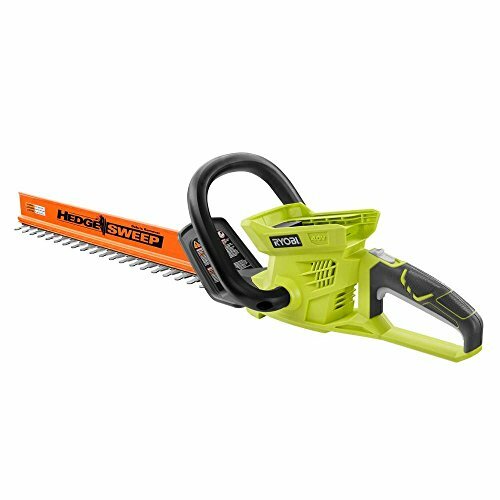 It has 24” dual-action blades with 3/4” cutting capacity. The dual action blades keep the machine well balanced, with less vibration as a result. The wraparound handle is great to comfortably hold the trimmer in a vertical position. The HedgeSweep debris shield is trademarked by Ryobi. The idea is that clippings are diverted off of the hedge as you work. 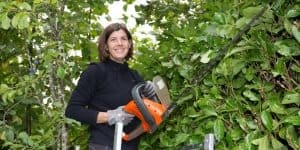 This reduces the amount of clippings left in the hedge, which is great, because old clippings will turn brown and ruin the aesthetics of your hedges. The powerful 40 Volt lithium-ion battery will last you a long time, you will likely run out of juice before the machine will… The great thing about the 40V battery system is that you can run a range of power tools on the same batteries, giving you the ability to buy only the bare tools once you have a set of batteries, saving you lots of money. The most obvious drawback of a more powerful machine such as this one, is the heavier weight. This machine comes in at 9.1 Lbs. The position in which you have to hold the trimmer to reach a desirable result adds to the strain that will be put on your body. Elderly people, women, or people with limited power might want to consider the 18V model below, which is lighter in weight. This trimmer is equipped with the latest lithium+ technology. 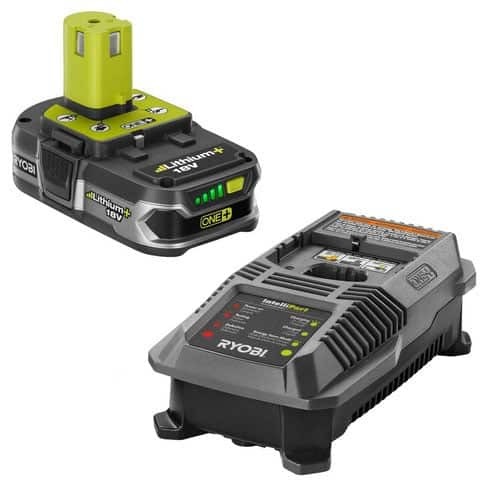 This is the most advanced battery Ryobi offers. Lithium batteries do not fade, instead they keep outputting maximum power until the very end of its battery cycle. 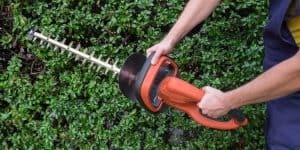 This trimmer has the power of a corded trimmer, without the cord. This trimmer is somewhat lighter in weight than the 40 Volt model. 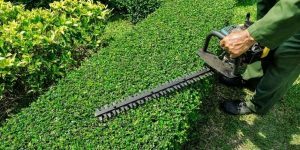 It is meant for lighter duty tasks, but will handle most hedge trimming jobs with ease. It is only when the branches get really thick that this machine will struggle. This 18V machine is recommended for branches up to 3/8 inch thick. The model I recommend here is equipped with an 22 inch blade, which is the maximum that I would suggest for this size of machine. Anything longer than that and the motor will be underpowered to cut anything substantial. This model also comes with the same orange guide on the blades to get rid of foliage clippings as you’re cutting. If for whatever reason you dislike this feature, it is easily removable. The wraparound handle will allow you to stay comfortable. This model also comes with a wall hook for easy storage. This product is in an a different category than the two products reviewed before. It shouldn’t be compared to any of those. Rather than maintaining big tall hedges like the above models, this model comes into its own doing more precision and touching up type work. 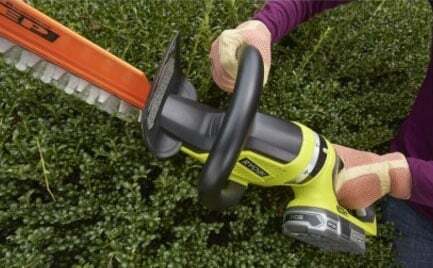 Shaping boxwood (buxus) for example, or cutting ornamental grasses, is something this trimmer will be great for. This cordless shear is designed to be handled one-handed, and well balanced to be able to give you a precise cut. It has the ability to quickly transition from shears to shrubbers in seconds for even more precision. The blades on this model are dual action blades, which means there are two blades moving in the opposite direction, which results in a smooth operating, well balanced machine. It is actually surprisingly powerful and is able to cut through branches of 3/8 inch in diameter. Surprisingly powerful for such a nimble machine. Ryobi is a widely known company that manufactures power tools such as drills, saws, sanders, routers, nail guns and specialty products. These are going to be useful for everyday household needs such as hanging pictures, making or fixing furniture, and many other tasks. 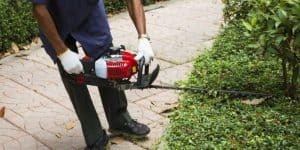 They also create outdoor tools such as string and hedge trimmers, blowers and snow blowers, chainsaws, pressure washers, generators and mowers. These products will help to cover all your outdoor needs whether you need to get snow or leaves out of your driveway, or chop firewood. This wide range of tools gives Ryobi the ability to meet the needs of all their customers, no matter what it is they may be in the market for. Ryobi began in Japan, but is now available in 12 facilities spanning 6 countries, including the US. This allows them to get their products out to people in a large variety of areas. In the US, they are found mostly at Home Depot, making them particularly exclusive, but also easily available given the popularity of Home Depot. This relationship between the two companies has allowed both to flourish. You can also find Ryobi products online for an even greater level of access. Ryobi was founded in 1943 in Japan. Before the company dived into the power tool market, it made its way through the manufacturing of several other products including printing presses in 1961, door closers in 1963 and fishing tackle in 1966. In 1968, Ryobi finally started its creation of power tools, which ultimately ended up being the primary market for Ryobi products. While there was a brief divergence into golfing products in 1983, that effort eventually faded away. However, Ryobi power tools have remained at the head of the market, providing high quality products. By 1985, the company had made its move into the US, setting up shop in Indiana. To this day, it exists as one of the biggest competitors in the power tool industry and is likely to do so moving forward. It isn’t uncommon for companies like Ryobi to try out a few different products before finding the market that best suits the company. It also shows that the company is flexible enough to make all those changes while still having a high enough quality product to be successful. Ryobi today represents one of the smaller brands and is primarily available through Home Depot. However, it does have a nicely sized selection of equipment that is sure to meet the needs of any customer. Ryobi products can also be ordered online, which is a very easy way to get the tools you need as long as you can afford to wait for the items to be shipped. The company is owned by Techtonic Industries, which is centered in Hong Kong and their products are sold in Canada, Europe, Australia and New Zealand. Selling products in multiple countries gives Ryobi access to the different kinds of markets those cultures can create. Each area is likely to have different needs, and Ryobi shows that it can find ways to meet the needs no matter which country or climate the business is in. 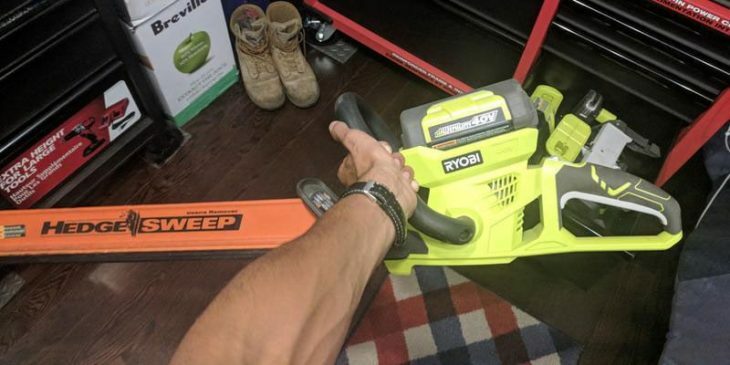 Is Ryobi owned by Home Depot? No, Ryobi is not owned by Home Depot. Ryobi is a brand name of Techtronic Industries. They are also manufacturer of brands such as Craftsman, Milwaukee, AEG Powertools and Homelite among others. Does Ryobi have a lifetime warranty? 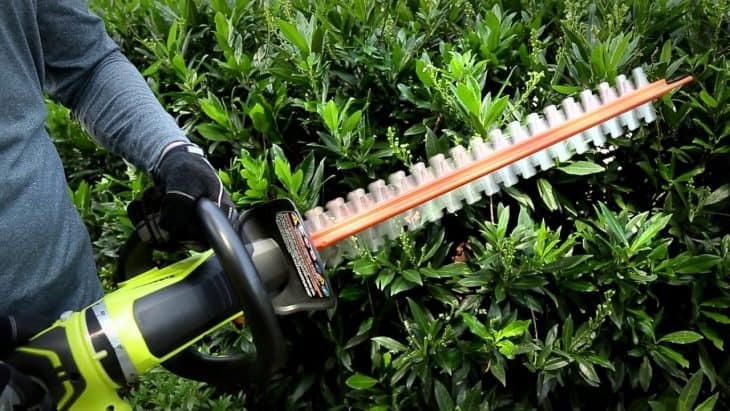 Ryobi hedge trimmers either have a 3 or a 5 year warranty. It is a testament to their quality, and shows that they really stand behind their products. Are Homelite and Ryobi the same company? Homelite and Ryobi are both owned by the same company, but they have different design and manufacturing processes. However one could argue that they are the same company. Is Ryobi made in the USA? Ryobi Die Casting Incorporated, is a manufacturer of products for the automobile industry in Shelbyville, Indiana. Ryobi outdoor power tools are made by Techtronic Industries in Hong Kong.